Cinnamon (Cinnamomum verum, synonym C. zeylanicum) is a small evergreen tree belonging to the family Lauraceae, native to Sri Lanka, or the spice obtained from the tree's bark. It is often confused with other similar species and the similar spices derived from them, such as Cassia and Cinnamomum burmannii, which are often called cinnamon too. The name cinnamon is correctly used to refer to Ceylon cinnamon, also known as "true cinnamon". 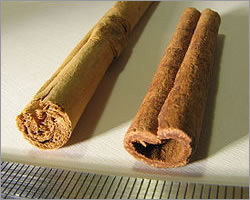 However, the related species, Cassia , Saigon Cinnamon, and Cinnamomum burmannii are sometimes sold labelled as cinnamon, sometimes distinguished from true cinnamon as "Chinese cinnamon", "Vietnamese cinnamon", or "Indonesian cinnamon"; many websites, for example, describe their "cinnamon" as being cassia. Ceylon cinnamon, using only the thin inner bark, has a finer, less dense, and more crumbly texture, and is considered to be less strong than cassia. Cassia has a much stronger (somewhat harsher) flavour than cinnamon, is generally a medium to light reddish brown, hard and woody in texture, and thicker (2–3 mm thick), as all of the layers of bark are used. Due to the presence of a moderately toxic component called coumarin, European health agencies have recently warned against consuming large amounts of cassia. Coumarin is known to cause liver and kidney damage in high concentrations. True Ceylon cinnamon has negligible amounts of coumarin. In a study published by researchers at the U.S. Department of Agriculture in Maryland, cinnamon reduced the proliferation of leukaemia and lymphoma cancer cells.